Loads4Less is much more than a simple A to B transport business. It provides low-cost house removals, UK and European deliveries, shipping, packing, storage and furniture recycling. Adam Soall explains how his business has grown with support from Nwes. It was in the middle of the recession in 2010 when I spotted a gap in the market for low cost removals. With a variety of career experiences and a passion and drive to succeed, Loads4Less was born. Tell us about your business and what makes it unique? The business is much more than a simple A to B transport business. It provides house removals, UK and European deliveries, shipping, packing, storage and furniture recycling. I have built foundations on attempting to get everything right first time. I source professional operational staff who are focused on customer service. I attempt to carefully coordinate jobs to save on carbon emissions and enable savings to be passed onto my customers. The business also offers an hourly rate on local moves to allow customers to exactly manage their removal needs. A close relationship with Big Yellow Storage group, which has 86 stores nationwide, can also be a great help for my customers. The support from Nwes and Future50 has been superb. We have benefited from excellent business advice and coaching, and we were awarded a grant which has assisted in growing the fleet of vehicles. Through networking at Future50 functions, I have agreed a deal with Naked Wines, which has improved the offering my customers enjoy with using Loads4Less. I’ve been supported by Nwes Business Consultant Richard Voisey throughout. The business, which employs 12-15 staff based on seasonality, was recognised in 2012 with a Best of Norwich award, and bronze winner for the Scoot awards. In 2015, we were acknowledged as an innovative, growing, investing business in Norfolk with membership to Future50, a business growth programme that is designed to recognise Norfolk and Suffolk’s most innovative companies. I have a huge amount from running a business that I feel so passionate about. Although it can be stressful at times, there are so many highlights, such as developing a team, making new contacts and developing both as a business and an individual. Having an energetic and passionate team is crucial to our business and the success we have achieved. 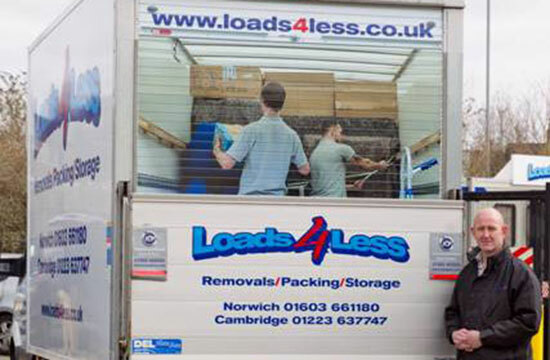 Loads4Less continues to go from strength to strength and I have recently formed a relationship with the charity EACH (East Anglia’s Children’s Hospice) by donating furniture. Having set a conservative target of raising 10k in three years, the charity’s sales have already tripled in the first two weeks of the scheme and benefited to the sum of £1,100. My plans for the future include expanding nationwide and I hope to have eight locations within the next two to three years.